Hog Roast for a Tropical Garden Wedding! It may have been a blustery September day outside, but the Taste The Cracklin team were in somewhat of a tropical paradise last week when we were asked to provide the catering for a wedding reception taking place in the orangery of a local garden centre! Blissfully ignorant of the rain battering against the windows, we spent a pleasant morning nestled amid exotic foliage as we freshly prepared one of our delectable 3 course wedding meals, complete with canapes, for bride and groom Sara and Craig and their 50 weddings guests! On the menu was our crowd pleasing homemade soup, our trademark spit-roasted pork accompanied by roast potatoes and seasonal vegetables (all fresh and locally sourced of course! ), a light and tasty quiche for the vegetarian option, all followed by some refreshing fruit salad and individually handmade cheesecakes! 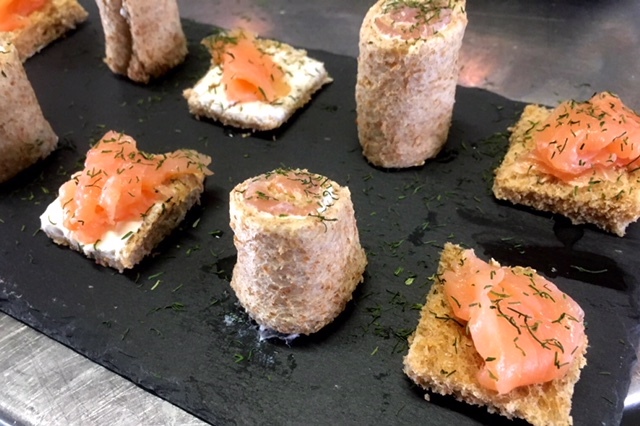 As if all that wasn’t enough, we were also hard at work carefully crafting our canape selection, including smoked salmon, pate en croute and mini gourmet sausages! A rustle of leaves and some excited chatter announced the arrival of the wedding party and the Taste The Cracklin Front of House team were ready to greet everyone with our freshly made canapes and a glass of bubbly to toast the bridge and groom. It was a great choice of venue for a wedding that was taking place after the weather had taken a turn for the worse and it was an elegant space in which to celebrate the union of the happy couple. The food was deemed just as elegant by the 50 wedding guests as our incredibly efficient waiting staff provided table service and made sure all of the guests were well taken care of! Every course was met with great enthusiasm by the entire wedding party and Sara and Craig were very glad they had chosen Taste The Cracklin to do the honours on their big day! An exciting menu, one of our superb hog roasts and a tropical paradise in which to enjoy it whilst it’s pouring down outside-what more could anyone ask for their big day!